Now, where was I? Away in a haze, probably. But I really must tell you about the time Dobson wangled himself a job on Modern Snipe magazine. It is a wonder that a pamphleteer with so shaky a grasp of ornithology should seek employ on such a title, but Dobson had his reasons. Well, reason. 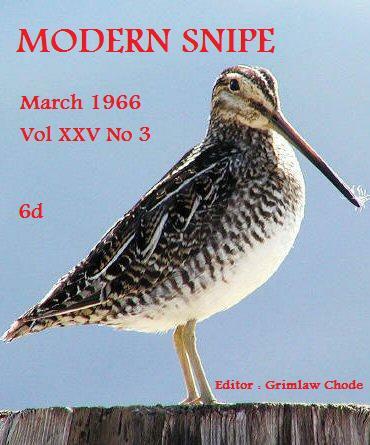 In the course of a conversation with a regular down at the Cow & Pins, Dobson learned that the name of the editor of Modern Snipe was an anagram of Marigold Chew, and he chose to see in this some sort of mystical significance. Ten minutes later, he was hammering in a decidedly non-mystical manner on the office door of Grimlaw Chode. The offices of Modern Snipe were at that time a suite of rooms on the top floor of a massive and efficient laundry building. Steam billowed from open windows and pipes and ducts, and an overpowering odour of boiling shirts and soap powder pervaded the neighbourhood. Never the most observant of men, Dobson did not look up as he approached to see if any birds perched on the roof, but had he done so he would have seen but a solitary crow, and not a snipe in sight. We do not know how Dobson convinced Grimlaw Chode to take him on at once as a special rapporteur, but we do know that Chode, like the United Nations, was given to bandying about the word rapporteur rather than reporter. There was no element of pretension in this. Chode came from a family of international diplomats, and had modelled the editorial structure of Modern Snipe on that of a mixture of huge transnational organisations, of which the UN was only one. OPEC and CAFCON and SMERSH were in there, too. He gave Dobson a blue helmet to wear, and told him to go away and write something exciting about snipe. It is tempting here to veer off into a digression about Dobson and hats, a topic of endless fascination to some of us. But I fear things would get out of hand, particularly if I began to babble on about Dobsonâ€™s Homburg, itself a single hat that evokes a world of allusions and references, from James Mason to Procol Harum. Better that we address such matters at another time, and content ourselves now with the image of the pamphleteer trudging home along the towpath of the canal, a gleaming blue helmet atop his cranium, and the brain inside that cranium throbbing with an inchoate tangle of cerebral gibberish, at the dim centre of which lurked the signal fact that Dobson knew nothing whatsoever about snipe. How fine a bird the snipe is! But first, consider this: he who wishes for the cloths of heaven may find his hopes dashed and his garb but rags and tatters. Yet there be not woe in this, for is it not the stamp of such a man that he looks out upon a darkling plain and pitches forth his wishes into a well where one day pennies will be spilled? At this point Marigold Chew came in from the garden. She had one of her trained bees on her shoulder, like a pirateâ€™s miniature parrot. â€œWhat on earth is that blue helmet hooked on to the hat-peg?â€ she asked. Dobson explained. Marigold Chew was aghast. â€œI have nothing but admiration for your talents as a penny-catch-all pamphleteer,â€ she announced, as her trained bee swapped shoulders, â€œBut the job of special rapporteur on Modern Snipe will prove your undoing!â€ And she swept dramatically out of the door, and headed off in the rain to Hubermanâ€™s department store, to make enquiries about bee baskets. Dobson returned to his notebook. As your special rapporteur, he scribbled, it is my job to bring to readers new and unexpected perspectives on the travails of the modern snipe. That much I shall do, without fear. I once had custody of a clairvoyant pig, and in a very short time it taught me many things. One lesson I recall was sweet indeed. At that time I was fond of wearing my Homburg hat. It was the hat I wore when studying the Hittites, and now I wore the hat to study the pig. One day, walking across a field with the pig in tow, I stopped to mop my brow, and removed my hat and placed it on a stone. At once, out of the sky swooped a big-beaked bird and perched upon my Homburg. Was it a snipe? It may have been. I looked at the bird, and then I turned to look at the pig, and I realised with a start that the pig saw neither me nor the bird, for being a clairvoyant pig it could see only the future, centuries hence, when where we stood was a darkling plain, and the spot where I laid my hat was a deep dark well, at the bottom of which was a mountain of pennies chucked in hope by generation upon generation of the disappointed. And I further realised that all that hope was embodied in the form of the bird perched on my Homburg. And I affirm that, yes, it was a snipe. The last sentence was a complete lie, of course, as Dobson could affirm no such thing. But he was extremely pleased with his initial foray in to the heady world of contemporary ornithological journalism. Slapping the blue helmet back on his head, he stuffed the notebook into his satchel and crashed out of the door. On the canal towpath, he met Marigold Chew. She was carrying half a dozen bee baskets and the evening newspaper. â€œLook at this,â€ she said. Dobson read the headline on the just-published Evening Dachshund. He was not a man who often goggled, but he goggled now. SNIPE MAN SLAIN, it read. Within the last hour, Grimlaw Chode had been shot dead. By a sniper. And so ended Dobsonâ€™s career as a birdy rapporteur. This entry was posted in Bees, Dobson, Marigold Chew, Prose by Frank Key. Bookmark the permalink. Thank L. Ron Hubbard that you are back with us, and writing such fine prose! And was “Modern Snipe” finished at the instant editor was murdered? There are so few researchers who have devoted serious time to the issue of ornithological assassination.